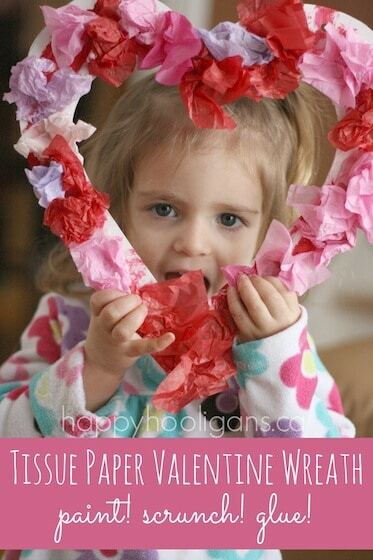 Tissue Paper Valentines Wreath: a fine-motor Valentine’s craft for kids! 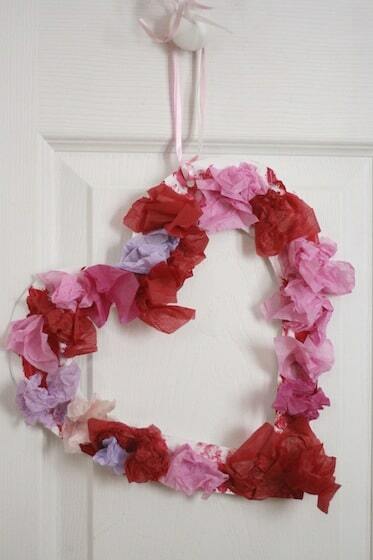 Our tissue paper Valentines Wreath is the perfect Valentines craft for toddlers and preschoolers to make. It’s bright and colourful, it’s a great fine-motor and sensory activity, and it’s a craft that’s easy enough for very young children to do. In my opinion, tissue paper is one of the best craft supplies going when it comes to kids’ crafts. 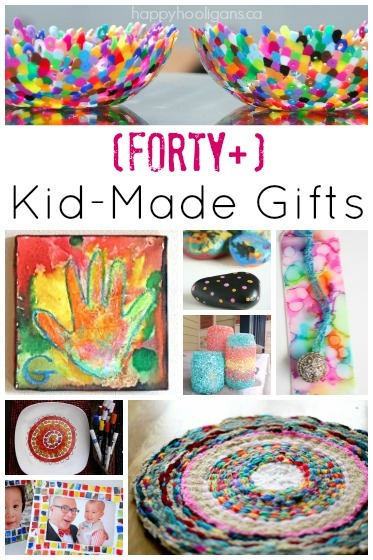 Here are just a few reasons why I have a huge stash of it in my craft room: It’s inexpensive; I’m the one at birthday parties and baby showers eyeing up the tissue paper littering the floor while all of the other guests are eyeing up the gifts. Yep, I bag it all up, and take it home. Reduce, re-use, recycle, right? 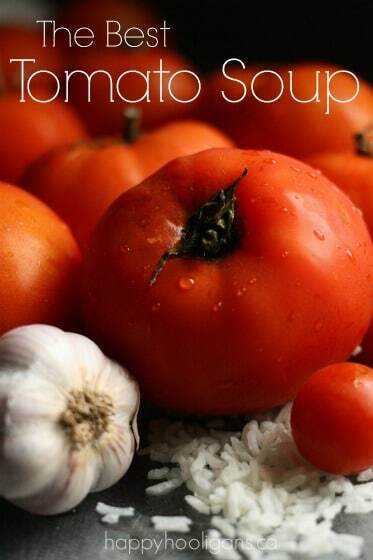 It’s a great sensory material. It’s soft and delicate and lovely to touch. It sounds great; kids love the rustling, crunchy sounds it makes. You can wrinkle it, crumple it, rip it up or fluff it up. 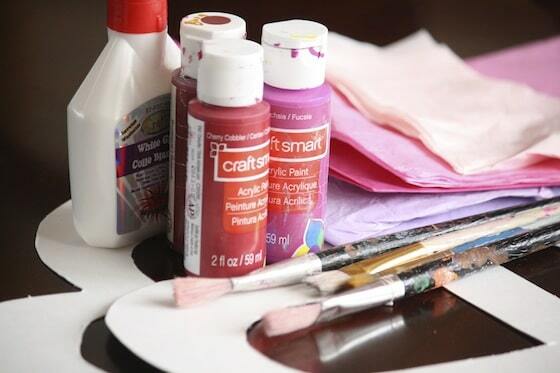 Tissue paper adds texture and dimension to whatever you’re making. It’s incredibly versatile! You can transform a sheet of tissue paper into snowflakes, feathers, leaves or butterflies. You can iron it flat, crunch it up, decorate a window or decoupage a glass jar. I think you’re getting the idea… Now on with our wreaths! I cut a large heart out of cardboard, and I cut out the inside as well. 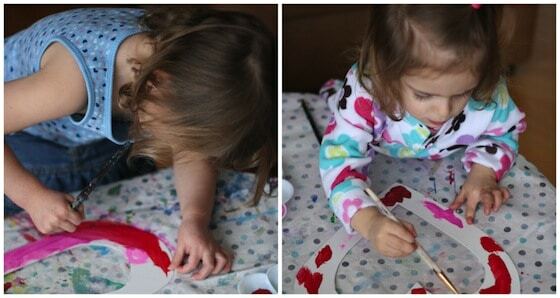 The hooligans painted their hearts, using all of the colours in the paint tray. When the paint was dry (a blow-dryer can speed up the process), they crumpled up the squares of tissue paper, and glued them all over their hearts. We had 3 types of glue out today. A squeeze bottle, glue sticks, and these great tubes of glue with sponge applicators . The hooligans had fun experimenting with all three. Crumpling and gluing the tissue paper is a great fine-motor exercise. Look at those little hands at work. When they were happy with their work, I punched a hole in the top of their wreaths, and attached a ribbon for hanging. I want to be a Hooligan! Do you have fun ideas for felt? I bought a package and now I’m at a loss!!! Can you and the Happy Hooligans give Seth and I some fun projects?!!! Hi Shelly! I have one felt post. 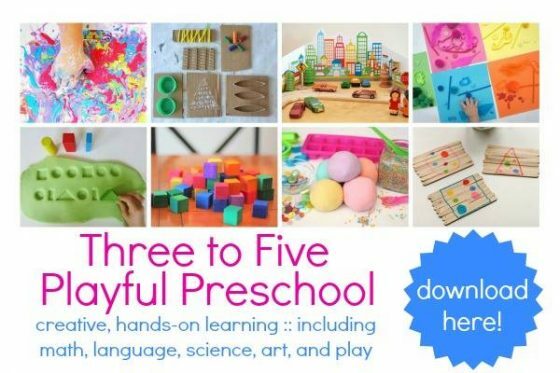 It’s a great fine-motor activity that teaches buttoning skills: https://happyhooligans.ca/button-snake/, but Deborah from Teach Preschool has an entire pinboard dedicated to felt:http://www.pinterest.com/teachpreschool/felt-fun/. I’m sure you’ll find some great ideas there. Love that little Valentine in the first picture. Looks like they had a lot of fun!! Thank you Jackie and The Hooligans for the Valentine inspired tissue paper wreaths! Perfect project for two little girls! Happy Valentines to you! I love this idea! Gotta love when fun and easy meet up in the middle. Nice project, for my granddaughter who is 18 and developmentally disabled. I get to work on it also,. I do the cutting and I will help her with the gluing. I will be sharing this idea with her VE-1 teacher. I did this today with my 3 year old and she loved it! 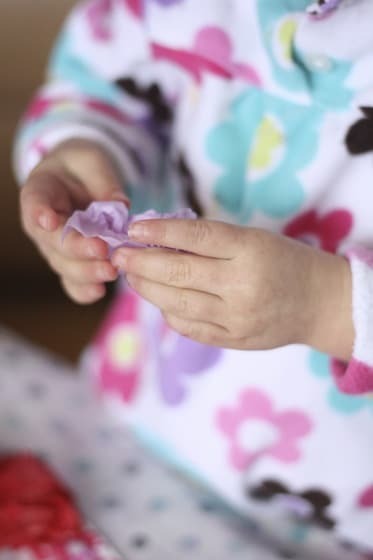 She really enjoyed scrunching and gluing the tissue paper, such a simple idea but one we have not tried before. Adorable!! Thank you for sharing at Sharing Saturday! 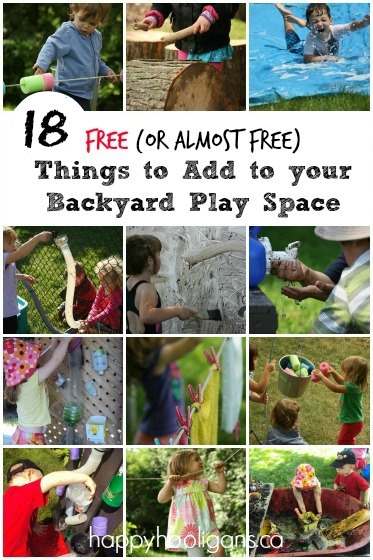 This would be a ton of fun for the little ones! I would mix glue in with the paint and have the kids stick the tissue paper on right away. 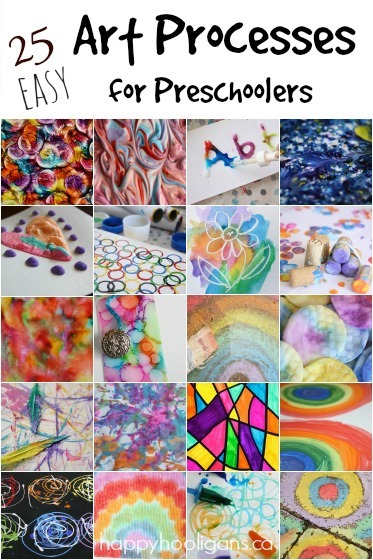 Think I will do with my preschool class! I love this! 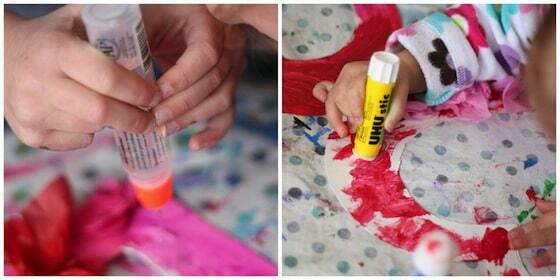 .. one suggestion (especially for tiny tots) is to add glue to the paint. 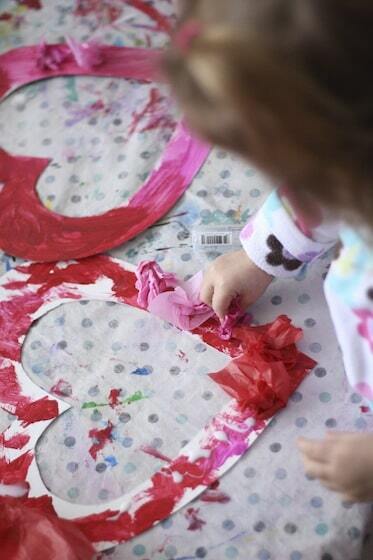 Once the paint is on and while still wet, the kiddos just crumple and place their tissue paper. That is brilliant, Kiki! I’ve never thought to incorporate glue into our paint. I love the way you think!